It's one of the most memorable cartoons—which is mostly a good thing. 1. When Chuckie sees that his father, Chaz, has been talking to a sock puppet named Socky for years because Chuckie was never born. In "Chuckie's Wonderful Life." The image of obese Angelica is terrible too. 2. When Stu takes Tommy to the post office and Tommy falls through a chute, onto a conveyor belt and nearly lands in this pit with a skeleton. In "Special Delivery." 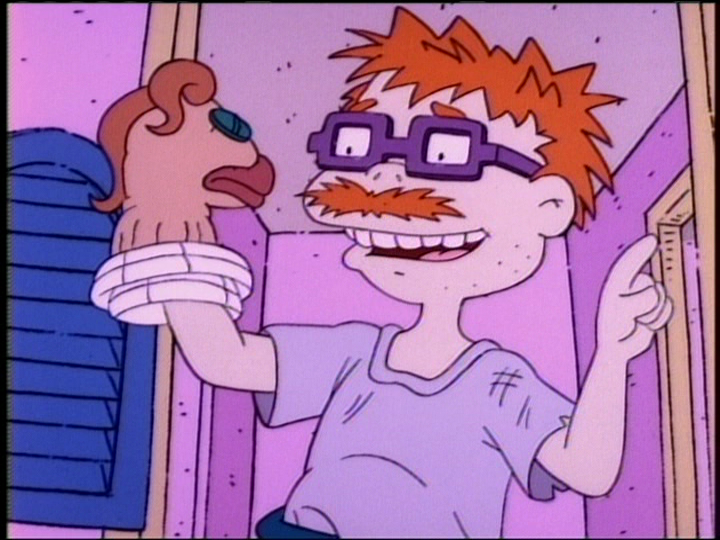 Another creepy part of this episode was this doll and this man. 3. When Tommy turns around to reveal his new clown face. In "In the Dreamtime." 4. When Angelica dreams she has a baby brother, not only do her parents completely ignore her and put her in the laundry room, but her giant baby brother tries to eat her. In "Angelica's Worst Nightmare." 5. When Angelica's father Drew screams "I'm a good father!, I'm a good father!" while being sent to jail because Angelica didn't want to eat broccoli. In "Pickles vs. Pickles." This may be more tragic than creepy, but having everyone in the courtroom cheer as as he's taken away is still bizarre. 6. When Stu's robot creation, Mr. Friend, follows the babies around, they try and destroy it. Even when they think it's destroyed, more show up. In "The Mysterious Mr. Friend." 7. 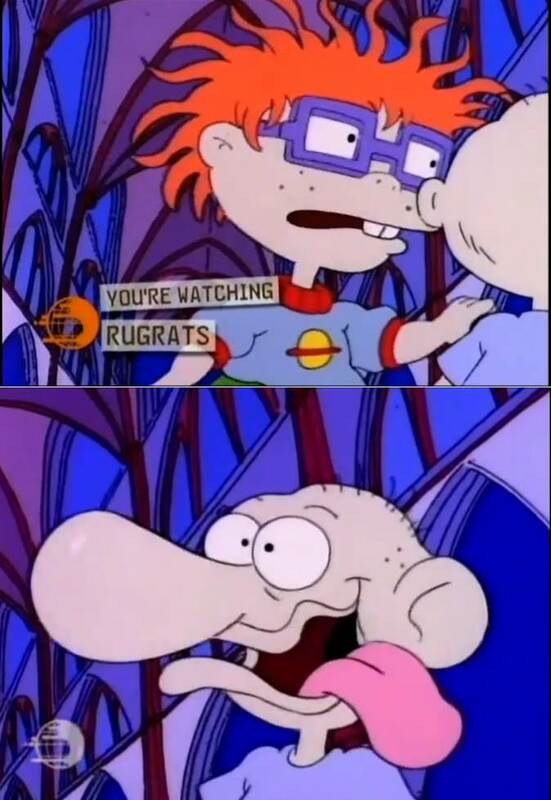 When Angelica steals Chuckie's glasses and he mistakes bushes for these demented plants. In "Chuckie Loses His Glasses." 8. 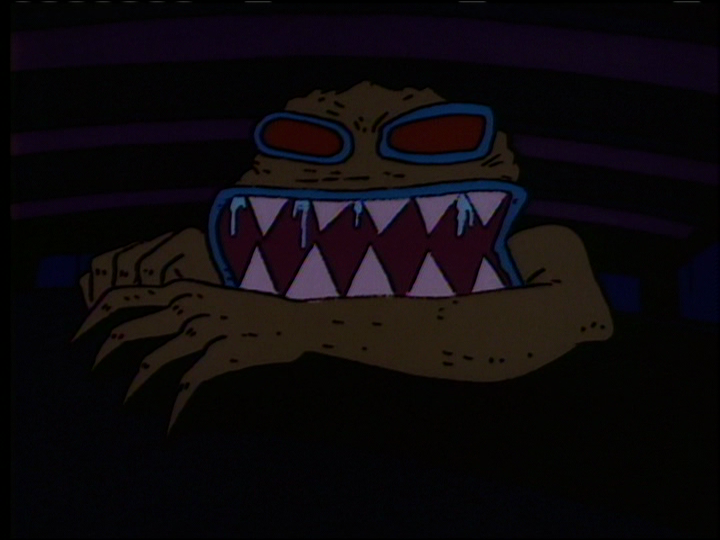 When Angelica tells Chuckie a monster lives under his new bed, Chuckie's mind goes to dark places. In "Under Chuckie's Bed." 9. When Chuckie is nervous about making the switch from diaper to toilet, he dreams he is in jail and is being forced to use the porcelain monster. He yells "not the chair!" but Angelica laughs and flushes him down it. In "Chuckie vs. The Potty." 10. When Stu hits his head and thinks he's a baby, the babies give him a makeshift diaper. Stu cries a lot. "Regarding Stuie." 11. 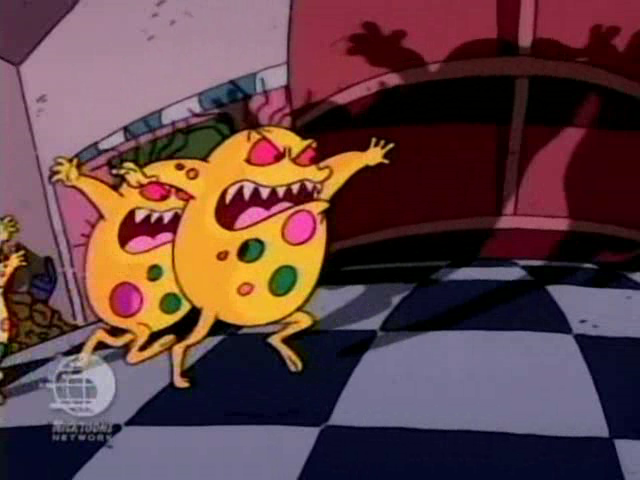 When Chuckie plays in the mud, then in the garbage, and then under his bed, Chaz tells him germs can be anywhere and Chuckie is terrified. He dreams that these giant germs are chasing him. "Mr. Clean." 12. 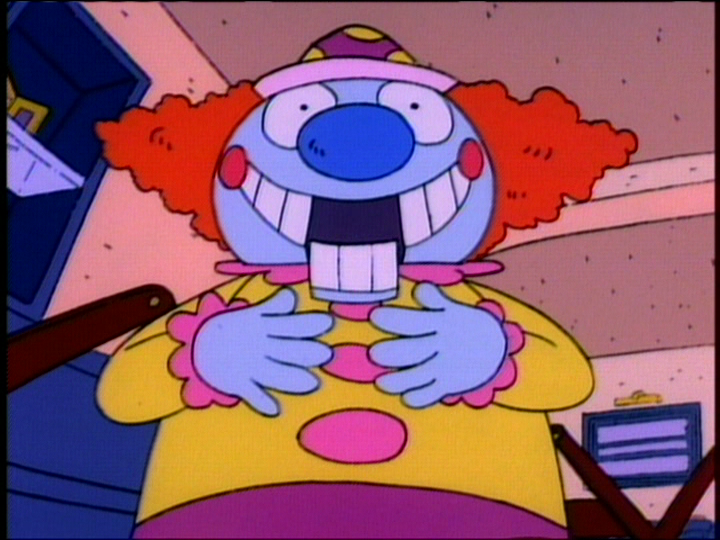 When another one of Stu's insane inventions, Mr. Boppo, is introduced Chuckie thinks it resembles a clown. In "Give and Take." 13. When Chuckie is convinced by, of course, Angelica that dust bunnies eat babies, he envisions being dragged away by one. In "Dust Bunnies." It's almost as terrifying as Frank. 14. And finally, here's another frightening clown face image. "I'm not Stu."